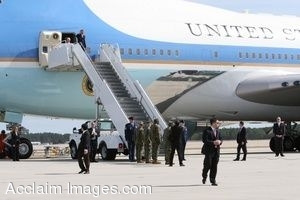 Description: Clip art photograph of President Barack Obama disembarks Air Force One during his visit to Marine Corps Air Station Cherry Point, N.C. Obama is en route to Camp Lejeune to deliver a speech on increasing troop levels in Afghanistan and an exit strategy from Iraq. (U.S. Marine Corps photo by Sgt. Sheila M. Brooks). Clipart photograph by Department of Defense Public Domain.